Nepenthes vogelii is another species that has recently been released for purchase within the last few years or so. 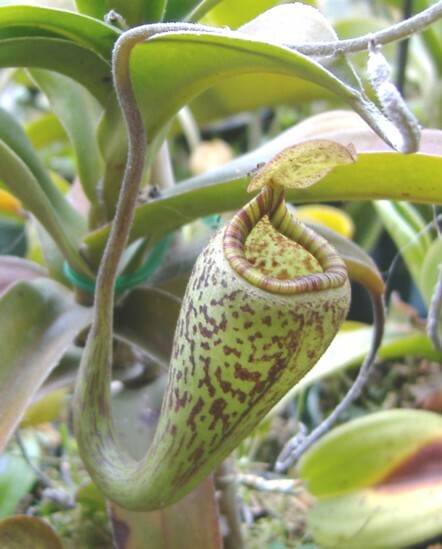 A species profile appears in Charles Clarke's book Pitcher Plants of Sarawak. The lower pitchers resemble N. fusca and look pretty similar but the uppers have a "wine glass" appearance with an indented peristome. The pitcher is also more funnel shaped as well. The first specimens that were released were from seed from Borneo Exotics. Now Borneo Exotics has them in tissue culture and are widely available. The price has also come way down while the overall size has increased. N. vogelii grows similar to N. fusca and N. platychila. I've found them to be less tolerant of cold temperatures than other highlanders. By cold I mean into the low 40's F during my winters. Under normal highland conditions they do fine. They may even be able to tolerate warmer temperatures over longer periods of time than typical highlanders. I think this is a nice species that isn't very demanding. Larger plants should be available as well as rooted cuttings. Since it grows like N. fusca I suspect this species will produce basals and sideshoots readily making cuttings more common.